ABC: After a GREY’S ANATOMY that was down 0.1 to 1.5, STATION 19 aired for the first time since November 15 and dropped 0.2 to 1.0 (also down 0.1 from last week’s A MILLION LITTLE THINGS finale). The season premiere of FOR THE PEOPLE was up 0.1 from last May’s season finale to 0.6, and steady with last week’s HOW TO GET AWAY WITH MURDER finale. 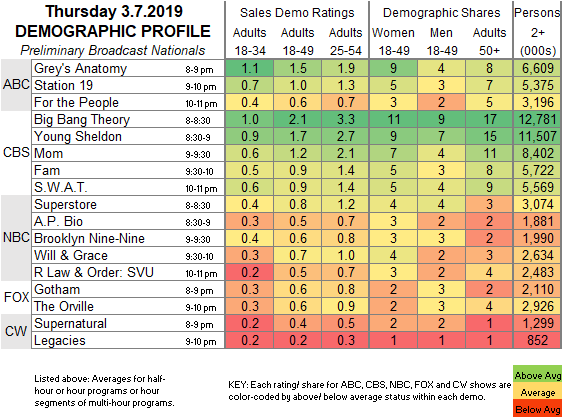 NBC: SUPERSTORE aired for the first time since December 13, and gained 0.1 to 0.8. The seasosn premiere of AP BIO was down 0.1 from last May’s season finale to 0.5. BROOKLYN NINE-NINE lost 0.1 from last week to 0.6, and WILL & GRACE was up the same to 0.7. The night ended with an SVU rerun at 0.6. 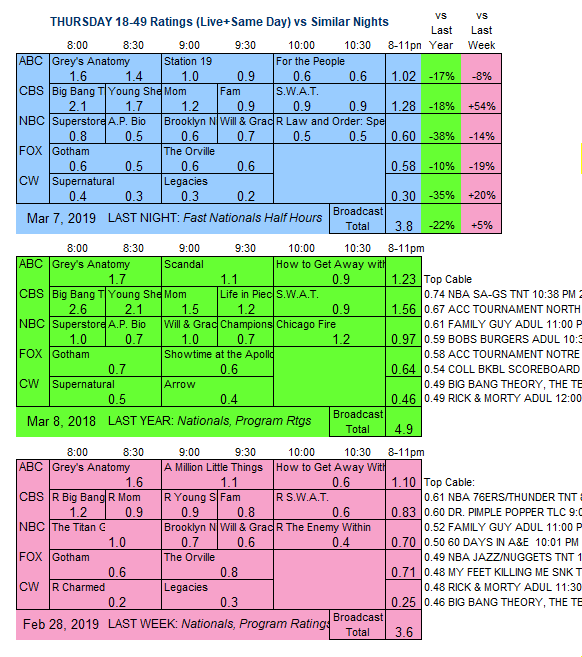 CBS: The line-up returned from a week off, with THE BIG BANG THEORY down 0.2 to 2.1, YOUNG SHELDON steady at 1.7, and MOM down 0.1 to 1.2. FAM was up 0.1 from last week to 0.9. SWAT was steady with its 0.9 from 2 weeks ago. FOX: GOTHAM held at 0.6, while THE ORVILLE fell 0.2 to 0.6. CW: SUPERNATURAL returned from a month-long hiatus down 0.1 to 0.4, and LEGACIES was down 0.1 from last week to 0.2. Tonight, CBS airs a primetime version of Gayle King’s interview with R. Kelly.